Two architectural representations of the Erechtheion temple (a digital one and an artwork) in the Acropolis of Athens (c. 420 BC). In this post I present digital reconstructions of an architectural detail in the southwest wing of (above) and of the temple of Erechtheion (below). Both refer to buildings of the Acropolis of ancient Athens. Guess who’s the figure standing in front of the Erechtheion! Ancient Boeotia and its city-states. Many modern scholars and historians (with prominent the Canadian historian Back) believe that the pro-Persian policy (calling “medizing” in ancient Greece) of Thebes and most cities of the rest of Boeotia during the 2nd Persian war (480-479 BC), was not as extensive as the ancient historian Herodotus (the main source for the Greek-Persian wars) tried to indicate. It is evident from the writings of Herodotus, that he discriminated in favor of Athens and Sparta (and against their rival city-states of Thebes, Argos etc.). It is recognized that the pro-Persian policy of Macedonia, Thessaly and Argos (other Greek states also “blamed” for “medizing” at the same time) was not really extensive. The Boeotian city-states (mainly Thebes) bear the “burden” of the blame of “medizing” , because of Herodotus. The ancient historian probably distorted the historical truth by noting inordinately their pro-Persian policy, which was not more intense than that of the aforementioned states. It is true that the Thebans and the Boeotians desired a Persian victory, only because of their hostility to their neighboring Athenians. So they possibly did not join the Greek Alliance, because its leaders were the city-states of Athens and Sparta. Argos did the same because of its hostility to Sparta. A beautiful original Boeotian helmet. This type was originally used by the Boeotian infantry and cavalry, but later it became popular to all the Greek cavalrymen ( comitatus.net). 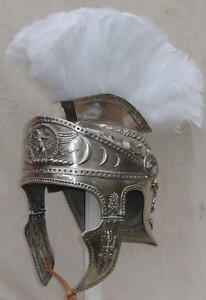 The standard type of Attic/Athenian helmet of the Roman officers. The Attic or Athenian helmet was an invention of the ancient Athenians, derived from a transformation of the older Chalkidean casque (or Chalkidian). The History of the Attic helmet spans to more than a thousand years and belongs paradoxically, more to the Italian-Roman rather than the Greek arsenal. The ancestral Chalkidean helmet (6th century BC) was a “lighter” type of the even older and famous Corinthian or Dorian helmet (the typical helmet of the Classical Spartans). The Chalkidean helmet came from the attempt of the Chalkideans to solve the problem of the limited vision and hearing of the hoplite, because of his Corinthian helmet. The Chalkideans were the people of the city-state Chalkis in the island Euboea, famous for its weaponry during the Archaic Era (7th cent. – 479 BC). It seems that the Chalkidean helmet was popular in Athens and Attica, as we can see in the Athenian vase-paintings. This preference might be due partly to the Ionic ethnological affinities of the Athenians and Euboeans.